Your car's performance exhaust system needs to be working correctly to keep your car in top operating condition. Performance exhaust systems, whether they are aftermarket exhaust systems, custom exhaust systems or stock systems, help your vehicle in a variety of different ways. The exhaust system creates a more enjoyable driving experience by quieting the engine noise. It also reduces air pollution by controlling the emissions your vehicle releases. Having a properly operating catalytic converter is crucial to ensure that the exhaust system does not have leaks. Visit your local Meineke #207 in Philadelphia, PA, today for more information about maintaining high-performance exhaust systems. It's important for drivers to know the signs of a failing aftermarket exhaust system. The easiest way to tell if there's a problem is when your exhaust system starts producing a louder sound. This means there is a leak in your high performance exhaust system. Leaks are usually caused when the flexible weave of the exhaust system starts to rust. This is the most vulnerable part of your exhaust. If you've noticed that your exhaust is louder and you're worried about a leak, contact Meineke #207 at Philadelphia, PA. and we'll diagnose the problem and take care of any muffler repairs you need. The exhaust system and muffler are some of the most essential parts of your vehicle outside of the engine. They are responsible for carrying the gases that your engine emits during the combustion process out and away from the engine, and away from you and your passengers. When this system fails or has issues it can become immediately apparent. If you suspect there is a problem with either your muffler or a component of your exhaust system, bring your vehicle to Meineke #207 in Philadelphia, PA, for inspection and repair. A catalytic converter is a commonly overlooked item on a car. This component is located inside of the exhaust pipes. It reacts chemically with spent fuel vapors that pass through it and completely burns away pollutants before they reach the outside air. Manufacturers are required to warranty these components for only 80,000 miles. While necessary, catalytic converters also restrict the efficient flow of air through an engine, which can minimally reduce the power output. High performance exhaust systems overcome this limitation, and many aftermarket exhaust components enhance the original design. Replacing worn out catalytic converters and installing custom exhaust systems are complicated jobs. Contact our in Philadelphia, PA, to see what we can do to improve or repair your vehicle. I need a new car exhaust system, where do I go? 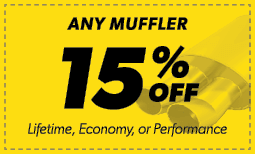 The best muffler shop for your vehicle in Philadelphia, PA, is Meineke #207. Our friendly and professional mechanics are custom exhaust experts. They can get your vehicle back in tip-top shape in very little time. We know that muffler repairs can be an unwanted expense, but you can’t afford to drive your vehicle around with a bad exhaust system in place. Along with equipping your vehicle with a performance exhaust that is tailored exactly to your vehicle’s specifications and use, we offer you the most competitive pricing around. Bring your vehicle in today for one of our quality performance exhaust systems for cars and experience the savings.